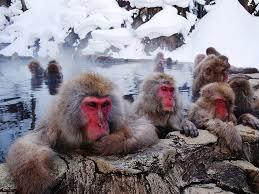 Jigokudani Monkey Park is located in Yamanouchi, Nagano Prefecture, Japan. It is part of the Joshinetsu Kogen National Park (locally known as Shigakogen), and is located in the valley of the Yokoyu-River, in the northern part of the prefecture. The name Jigokudani, meaning "Hell's Valley", is due to the steam and boiling water that bubbles out of small crevices in the frozen ground, surrounded by steep cliffs and formidably cold and hostile forests. The heavy snowfalls (snow covers the ground for four months a year), an elevation of 850 m (2,800 ft), and being only accessible via a narrow 2 km (1.2 mi) footpath through the forest, keep it uncrowded despite being relatively well known. It is famous for its large population of wild Japanese macaques (Macaca fuscata), more commonly referred to as snow monkeys, that go to the valley during the winter, foraging elsewhere in the national park during the warmer months. 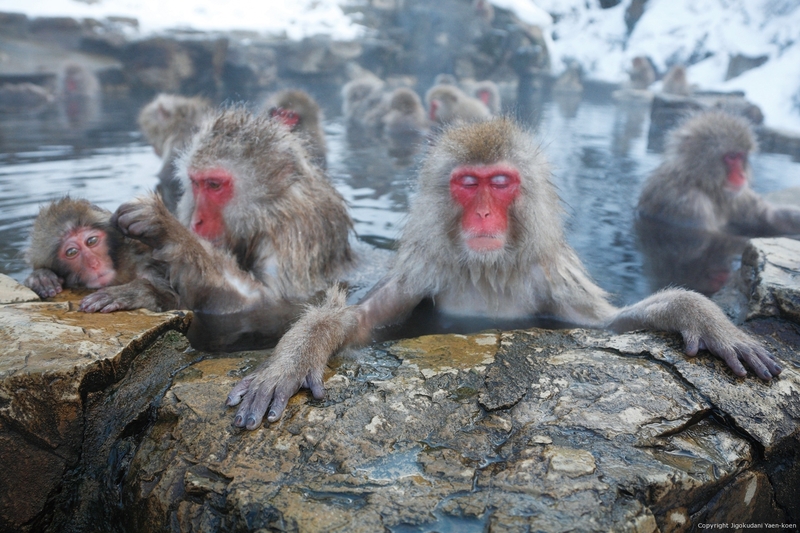 The monkeys descend from the steep cliffs and forest to sit in the warm waters of the onsen (hotsprings), and return to the security of the forests in the evenings. However, since the monkeys are fed by park attendants, they are in the area of the hot springs all the year round, and a visit at any season will enable the visitor to observe hundreds of the macaques. Jigokudani is not the farthest north that monkeys live. The Shimokita Peninsula is at the northern part of the Honshū island and the northwest area of this peninsula, latitude +41°31' longitude +140°56', approximately 500 km (310 mi) north from Jigokudani is the northern limit of Japanese macaque habitat. No (non-human) primate is known to live in a colder climate.